Strategy deployment is arguably the most crucial responsibility of business executives. Setting the direction for the organization and making the day-to-day decisions that drive the organization closer to “True North,” is what leadership is all about. But it’s not easy. There are a lot of other concerns that compete for resource and attention. It is easy to lose sight of long-term goals in the face of day-to-day events. Hoshin Kanri is a popular remedy for the challenge. It is a method for bridging the gap between strategy and execution. By laying out the strategic objectives of the organization and cascading goals down through every level, the organization has aligned priorities, and everyone moves in the same direction. Everyday process improvement is coordinated with the strategy and decision making improves. A favorite way to visualize Hoshin Kanri is an X-matrix. Since we added the ability to manage X-matrices in KaiNexus, we’ve received many questions about the technique. Here are the answers. 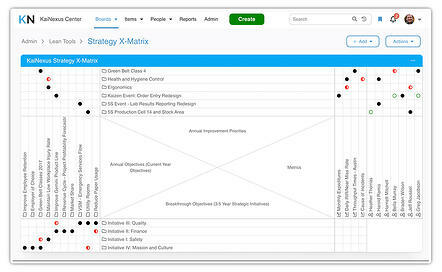 The Hoshin Kanri X-matrix is one chart that visualizes of your objectives, measures and targets, KPIs, and action items. The format creates an easy way to understand the relationships between short and long-term goals, as well as to define ownership and foster cross-functional collaboration. How is an X-matrix setup? Breakthrough Objectives (Bottom Quadrant) - This segment houses the strategic goals that are to be achieved within the next three to five years. There are usually only three to five goals, but they are essential to the future success of the organization. Annual Objectives (Left Quadrant) – These are the shorter-term goals that are necessary to reach the breakthrough objectives. The grid portion of the matrix lets you create a visual connection between each annual target and the strategic objective that it supports. Annual Improvement Opportunities (Top Quadrant) – This portion of the matrix contains opportunities for improvement. These opportunities correlate to an annual objective. The point is to align action items and the strategy. Metrics to Measure and Targets to Improve (Right Quadrant) – These will be the key performance indicators that let you know how well the organization is tracking toward the annual and strategic goals. Teams and Ownership (Far Right Side) - The far-right side of the X-matrix is used to put a name to each metric, improvement project, and objective. What are the benefits of using an X-matrix? Because the Hoshin Kanri x-matrix creates a tangible connection between the actions required today and the long-term goals, the strategy becomes part of daily thinking, rather than an artifact that gets brought out once a year. The approach increases accountability and breaks down the silos that can separate different functional areas. It also creates an early warning system for leaders by highlighting the performance indicators that foreshadow results. One often overlooked benefit of the X-matrix is that it forces leaders to create a clearly defined strategy that is easy to understand and doesn’t contain too many objectives. The simplicity of the design forces discipline and focus. How is the X-matrix managed and updated? Ideally, the X-matrix is managed as part of a continuous improvement software platform. This makes it accessible to everyone who needs it and keeps it top-of-mind. When the X-matrix is part of the CI platform, you can quickly drill down into the details of any improvement project or goal right from the matrix itself. The results of improvement projects are calculated in the system, making measuring the metrics seamless. Users can add the matrix to dashboards, so they see it every day. The most successful organizations review the X-matrix once a month to make sure it is updated and that no conditions have changed. This also gives leaders an opportunity to assess progress and make any need course corrections. An annual review is needed as well to check off the achieved goals and reset for the next year. The bottom line of the Hoshin Kanri X-matrix is organizational alignment. People are aligned because each person’s goals are related to the strategic goals. Activities are aligned because each improvement project and annual objective is connected to one of the breakthrough objectives. When you move the needle on the immediate concerns, progress is made toward True North.